[Another] commercial for Long Lines Internet services came on TV just as I finished titling this post … which was just after I took Long Lines’ We Dare You speed test, which was just after I took the speedtest.net speed test. My Mac has a 2.4 GHz Intel Core 2 Duo processor, and despite my almost weekly (at times daily) conversations with Long Lines (who promise connection speeds up to 5 MG in exchange for my monthly [cough] $44.99 + tax ISP fee), I just can’t help but feel the numbers aren’t quite adding up. 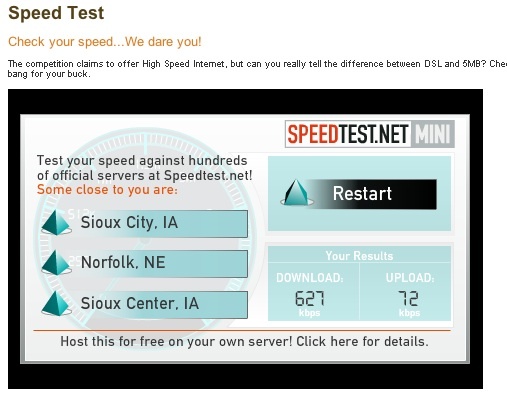 Long Lines tells me the 10 MB speeds are (so far) only available in South Sioux City, NE. Okay. So, I guess they get “up to 10MBs” for $41.99 while the rest of us pay $44.99 for “up to 5 MB.” And while both 0.44 Mbps and 627 kbps fall within that up to 5 MB range, they’re not exactly the speeds I feel I’m paying for. I know exactly what you’re thinking: So don’t just whine and complain — switch to a more reliable ISP! Here’s where I’d have to tell you we live in western Iowa. 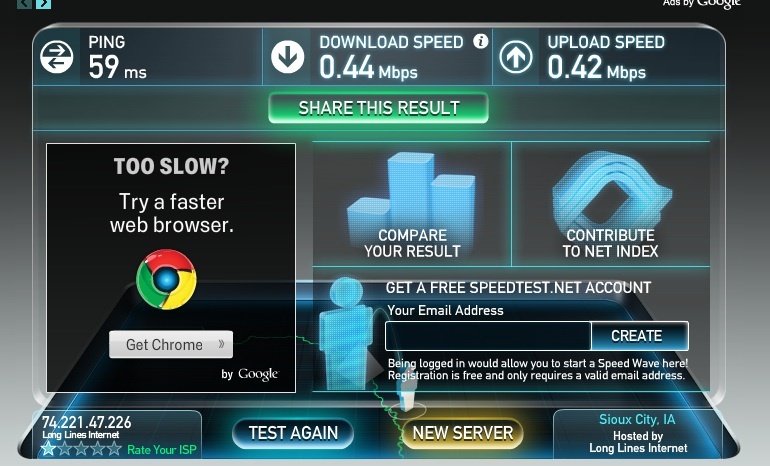 Sure, there’s another option: Qwest, which only guarantees speeds of up to 1.5 Mbps. For all I know, their customers might even be connecting at something close to that, but every time I think about switching, I remember some of those oh-so-glorious days where my speed tests actually registered around 4 Mbps and I was flying through page after page, getting things done, rather than constantly resetting the modem/router after waiting endless minutes for pages to load. Nowadays, I feel a little like a dog waiting for Long Lines to throw me the occasional high speed bone. I’m beginning to think, though, those 1.5 bones might be rather tasty — especially if Qwest threw me one regularly … like every single day.